Our recently-constructed facility is located on Golf Course Road in Grand Rapids, Minnesota, directly across from Grand Itasca Clinic & Hospital. Welcome to the dental practice of Dr. Lisa Johnson & Dr. Leanna McBride. Our professional team is pleased to provide you with exceptional cosmetic, restorative and general dentistry in Grand Rapids, Minnesota. We recently moved into a newly-constructed facility on Golf Course Road in Grand Rapids, directly across from Grand Itasca Clinic & Hospital. The new office offers better wheelchair accessibility, has more parking and allows us to provide enhanced care through the implementation of new technology. We are pleased to serve Grand Rapids, MN and the surrounding communities of Grand Rapids, Hibbing, Nashwauk, Keewatin, Marble, Taconite, Bovey, Coleraine, Cohasset, Effie, Bigfork, Marcell, Talmoon, Squaw Lake, Deer River, Ball Club, Bena, Remer, Hill City, Jacobson and MacGregor. 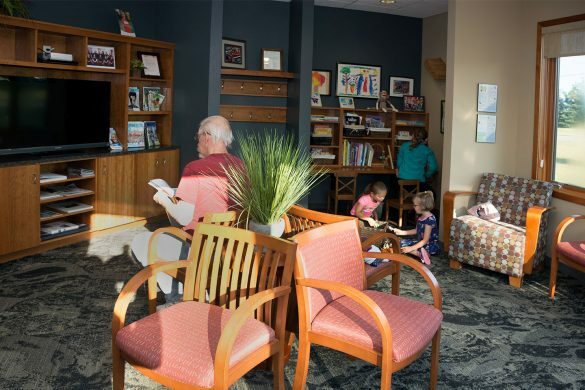 A comfortable waiting area puts Grand Dental Center patients at ease. A standard of excellence in personalized dental care enables us to provide the quality dental services our patients deserve. We provide comprehensive treatment planning and use restorative, general and cosmetic dentistry to achieve your optimal dental health. Should a dental emergency occur, we make every effort to see and care for you as soon as possible.